Welcome to Part 3 of Working On Your Monologue: Break It Down. Today, we will discuss how to breakdown your audition monologue. 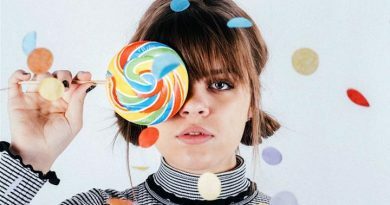 As a recap, Part 1 on Working On Your Monologue we went over the ways in which you may use your intuition to guide you when finding your monologue. 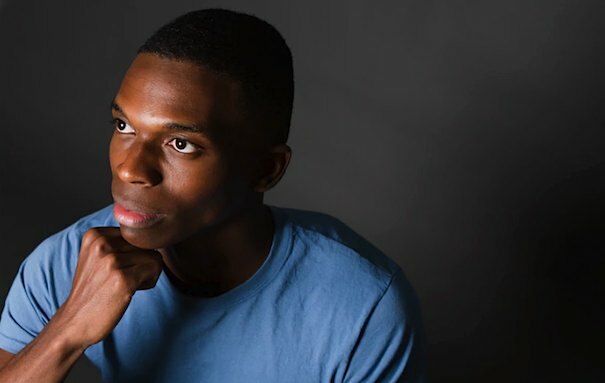 In Part 2 we examined the Given Circumstances and in what ways you can go about asking yourself questions to gain a deeper understanding of your monologue. We went over the 5 W’s (who, what, when, where, why) as a good rule of thumb to help open up your imagination. 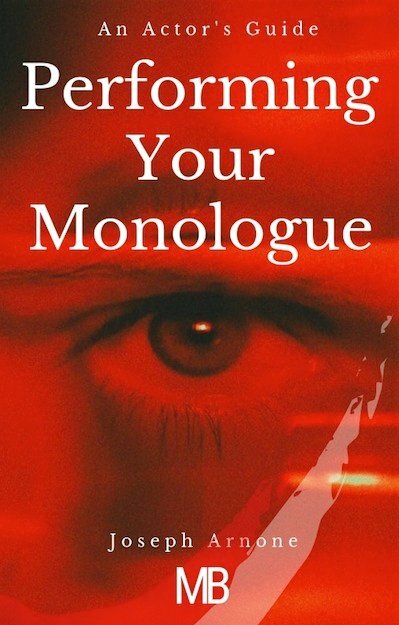 Breaking down your monologue is imaginative and technical and makes plenty of room for you to deepen the material. When you examine and break down your monologue, you are clarifying for yourself the different aspects of the piece such as its beats, actions, objective and movement. What is your character after in the monologue? When diving further into your monologue, it is essential for you to know what your character needs/wants/desires. The objective is your anchor into the line of direction you choose your actions to get what your character craves. Not having an objective for your monologue is sort of like not having a captain steering a ship through rough waters. In order to be a good captain, you need to have coordinates. The actor’s objective is his/her coordinates. 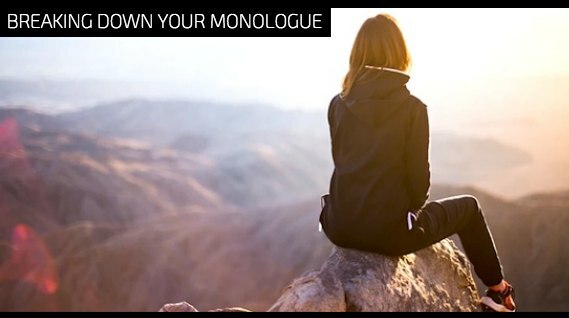 The Moment Before is a relatively common term in the acting world and is a good tool to use to help you ease into your monologue. The idea of the moment before is to have a life force already taking place before you utter your first bit of dialogue. Think about the moment before. What were you doing before you started speaking your monologue? What sort of day did you have? Retrace your day using your imagination and lead yourself up to the point of time wherein you begin your monologue. The beginning of your monologue isn’t truly its beginning. There is a life taking place prior to the first word you utter. That internal living will provide gravity to your work when you do speak the first word. There needs to be energy happening well before you begin speaking the words. Wouldn’t it be comical if an actor said those words without any truth to them within their inner life of the character? It is your job as an actor to supply the truth from the author’s intention. Going back to Rita from Protective Shield. What is her moment before? A beat is a change in your character’s inner behavior. As in life, when people have a conversation there are a series of shifts that take place. In a way, you get to work as a composer, marking your monologue where you see such changes. It is a lot of fun to score your script because like a composer, you get to try out different pieces of music (actions) for your instrument (you) and observe what chord strikes your heart as the most honest sound. On one line you can be complaining about something but then a beat takes place which creates a different expression from your character who becomes helpful. BRIANNA: (to guilt) I’m not so sure that you truly care about me. I am your sister and you treat me like trash. I only want us to be friends. Why? Why can’t we get along and be close? Don’t you want to have—(to scold) the faces you make. Do you see? You don’t really give a damn. I don’t know why I even bother trying! (to warn) If you don’t care about me being in your life than I’m going to stop trying. I don’t need the abuse and the hurt you cause in me. Action bring to life what is spoken. You want to decorate the life of your character with inner actions because they will give resonance and definitive purpose to the strength of your monologue. When you have your objective in place, you know where you are going with your character but the how of getting there is what actions are designed for. You may want to make someone fall in love with you again as your character objective. You may charm, challenge, guilt and so many other actionable choices that you will have a field day navigating your way to your objective. The inner brings about the outer and the outer brings about the inner. When you choose an action like to charm for instance and you fulfill your character’s agenda fully, you will suddenly find yourself expressing physical actions without any mental effort. It will happen on its own accord because you are focused on your action to achieve your objective. The same way there is a moment before, there is also a moment after. Your monologue does not end when you stop speaking. There needs to be a ‘next moment’ occurring inside of you that you are inwardly steering towards when you do finish speaking your monologue. Where is your character headed? Expecting? Are they closer or further away from what they want? Where you arrive at the end of your monologue should not be where you were at the beginning. There should be an evolution that takes place and if the writer does not supply one, then it is up to you to create such evolution for yourself. Be mindful of the moment after because it does seem to get neglected with monologues. Especially in the audition room because sometimes an actor can feel rushed. 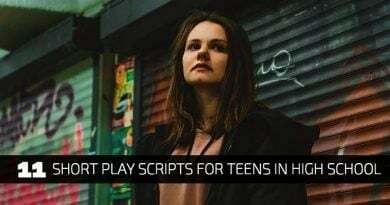 An actor needs to respect the casting process and yes there are auditions that are fast and timed because the casting director needs to see MANY people. But this still does not mean you should not have your moment after working inside you. Keep in mind that it is impossible to predict what will happen to your character in their immediate future just as we cannot predict in what way life will reveal itself to us three minutes from now. The moment after is the final intention the character makes which will lead into the very next moment, even though it is not seen or heard it should exist within you. 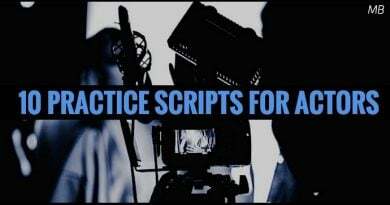 We have gone over aspects of working on your monologue when it comes to breaking it down further by touching on objectives, actions and beats. Don’t forget that the moment after is just as valid as the moment before for your monologue. 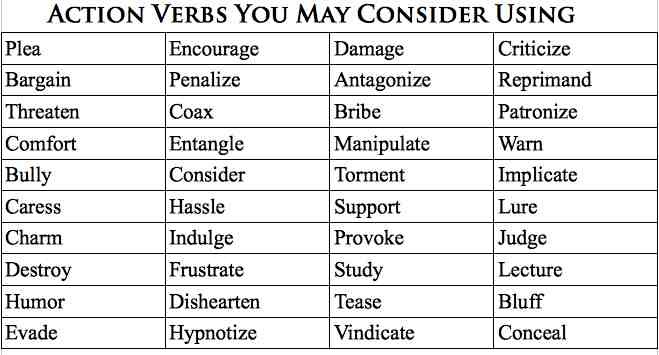 In our next lesson we will continue to go over additional aspect of working on your monologue.